The Marine Corps released more information about an ongoing offensive in northern Helmand province today, identifying it as Operation Tofan Sharq, or Eastern Storm. 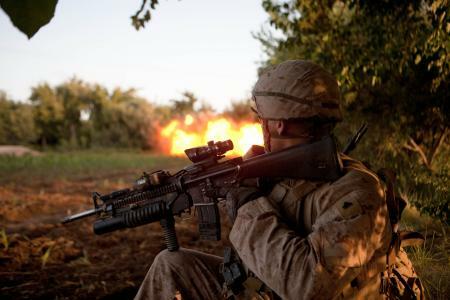 The offensive began with Marines pushing north from volatile Sangin district for five days along Route 611, the main highway in northern Helmand province, Marine officials said in a news release. “We are assisting the Afghan National Army’s 215th Corps to secure the main road between Sangin and Kajaki,” said Brig. Gen. Lewis Craparotta, commanding general of Marine ground forces in Afghanistan. “Senior Taliban commanders have been killed or forced into the northern portion of Helmand. The conditions are being set to encourage families to move back to Kajaki, into their homes in order to allow life to get back to normal. “We are giving the people an opportunity to live in peace, something they have not had in years,” he said. I’ve requested additional information about the mission, including which units are involved. Marine officers have previously said that about 2,000 personnel are in the mix. Battalions in the area include 3rd Battalion, 7th Marines, out of Twentynine Palms, Calif.; 1st Battalion, 6th Marines, out of Camp Lejeune, N.C.; 3rd Reconnaissance Battalion, out of Okinawa, Japan; and Echo Battery, 1st Battalion, 12th Marines, out of Marine Corps Base Hawaii. Anyone hear from those involved in this operation or do you know which Company of 3/7 is involved in this exercise? I have heard from someone involved. There is still more to be done, but things are going well. New update posted above. Thanks. Dan; saw your twitter page…impressive following. thanks for the effort…not up on twitter myself yet…I am looking to follow events with 3/7…have email updating events from my son recently…not shown in articles…are any of your guys up front with these guys? Thanks, Jerry. Marine Corps Times has embedded each of the last two years, and I plan to again in the spring. We don’t have anyone forward currently, though.